I just checked & it's all working here. 1) The aim is to obtain MISSING covers. If auto-save is enabled, searches when unable to load a cover according to main foobar2000 preferences (display > album art > front cover > search patterns) and there isn't a cover in the save location. So it ONLY searches when no cover is found through the above routes. 2) Search requires album artist / artist name & album name. So files need to have the tags. If either are missing it won't search, since they're required for searching. 3) The names have to match those used by the site. Autocorrect is on by default so there is a little lee-way in the matching. The site also has to have the cover you're searching for - it's pretty comprehensive though. There might also be occasions when the site is down, like over last w/e, but it all seems to be back to normal now. Yes, music files I use for this is properly tagged and I make sure there's no external images (ie. cover.jpg, front.png, etc) exist in the folder. edit: I searched my music collection and found some files that don't have embedded cover in it. the plugin works! It saved cover artwork in the same folder as the music files. back to play some other music w/ embedded cover, I let it play 2-3 songs to see if the site is not responding or down, plugin doesn't work. Is it possible that embedded cover in my music files stops the plugin from saving cover artwork? The check for an existing cover is whether the main foobar2000 preferences (display > album art > front cover > search patterns) is able to find a cover. That checks both embedded and external sources. Since the aim of Biography is to obtain missing covers, an embedded cover in a music file means you have a cover & so Biography doesn't search. It's not clear why you want to search if you have the cover. So it's all behaving as expected. Hi WilB. I've been waiting quietly for a Spider Monkey version but Santa Claus didn't bring this to me. Could you please update us on progress on this version. Not sure what is wrong =/ Thank you! In version 2.2.0 of foo_jscript_panel marc2k3 remove window.DlgCode. I check it - script work. 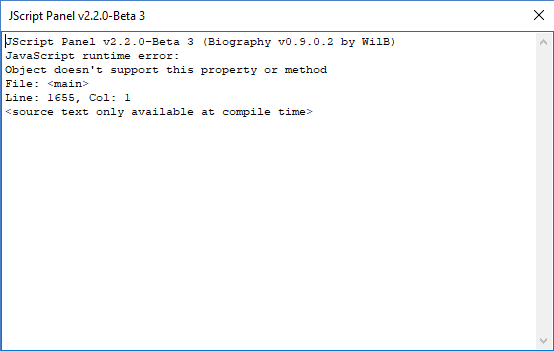 I have done a quick maintenance update of Biography (& also Library Tree & YouTube Track Manager) to fix compatibility with JScript Panel 2.2.0+. There are no new features. They can be downloaded from the usual locations. NEW: Touch Control (enable: menu > layout > options)***. NEW: Last.fm track reviews. In last.fm review mode there is now a choice of displaying album and/or track reviews (menu > sources > review > last.fm type). NEW: Ability to cycle cover images: front/back/disc etc and/or those in designated folder (menu > sources > cover). NEW: Theme options, e.g. Text: Show Summary First (menu > layout > theme). NEW: Lock option (Middle Click: "More Items Button"). Stops track changes updating display. NEW: Open containing folder (menu > sources > open containing folder). NEW: Tag writer: Write Tag: "Locale Last.fm" [multi-value]. CHG: Tag writer: tags written can now be set from menu. CHG: Require shift can now be set for the menu items: "Write Tags...", "Paste Text From Clipboard" (new default behaviour requires shift) and "Playlists" (panel properties ["Menu items..."]). *** for an extra scroll experience, if you don't have a touch screen, enable touch control and drag with left mouse button down. Panel properties will be reset as its a new panel. Export JScript panel properties or back-up layouts before updating if you want a record. Importing JScript panel properties isn't supported: panel properties have been overhauled & more key options are now on the menu. Server settings in biography.ini should update automatically if upgrading from a recent version, i.e. 0.9, 0.9.0.1, 0.9.0.2 and 0.9.0.3. If updating from an older version, biography.ini will be reset and the original backed up. Thanks so much for your scripts and effort!! It seems I can either cycle artist images from lastfm, or I can select a single local artist image (with no cycle option). Is that correct or am I missing a setting for cycling local artist images? Photo: Cycle. Cycles images in the set Image [Artist] Folder. This is where last.fm artist images are saved, and so it was logical to name the choice as "Cycle Last.fm". You could change this to another folder and disable downloading if you want a different set of images. Photo: Artist. This loads a single image & that was how it worked before. It loads from "foobar2000 > preferences > display > album art > artist pattern". Thank you for this wonderful panel. It is absolutely fantastic. I am having a problem with the Spider Monkey panel. When I switch to album reviews, the artist images are displayed instead of the album cover. I can get the album cover to display by clicking the more options button and selecting a specific album. But I can't scroll through the albums as I could in the jscript panel. I have read through the instructions but nothing I try seems to work. What am I doing wrong? Adding cycling of images for the current album (front, back, disc, etc) was added at the request of another user. But it means that there are now two possible things to cycle through and a choice had to be made over how the mouse wheel operates, i.e. either cycling through images of the current album OR cycling through the different albums. It is set to do the former while the mouse pointer is over the image and latter while the mouse pointer is over the "More Items Button". It was done this way for consistency with how the bio view and similar artists work. The "More Items Menu" drop down menu does clarify: "Manual Cycle: Wheel Over Button". I hope I have understood you correctly and that you will get used to this small adjustment. Regarding artist images showing in album mode. Please note the following. Cycling of images for the current album only happens if "Sources > Cover" is set to cycle mode. If set to cycle from a folder then yes extra images are included. I set it to load the artist images by default because I like the ability to cycle through the cover and artist images, but you can use your own folder. You can also use foobar2000 sources for front, back, disc, etc, or both together. Set "Sources > Cover" to front to just have the front cover. [Artist] Folder. This is where last.fm artist images are saved, and so it was logical to name the choice as "Cycle Last.fm". The labelling was confusing to me - "Cycle Last.fm" seemed to imply that it is only cycling through online LFM images. I'm guessing it looks in FB display prefs for artist image location? Thank you for your quick reply. I just enlarged the more items button to make it easier to scroll over so that issue is solved. And changing the cover cycle option to display only the front cover solved my other issue. It now works perfectly based on my personal preferences. Been closely following the thread about your Biography tool. I use the skin/theme DarkOne v4.0 by Tedgo, I'm in love with that one! Would like to keep it as it is, my settings with Biography works perfect. So, the big question is, can I safely without breaking anything install Spider Monkey Panel v1.1.5 - Hotfix II and Biography 1.0.0.? Spider Monkey Panel can be run alongside JScript Panel, & so other panels can continue to run in JScript Panel if you don't have Spider Monkey Panel versions. DarkOne v4.0 was modded to work with JScript Biography 0.9.0.2 by replacing one wsh_panel_mod with JScript panel. You would now need to locate that JScript panel in the layout and replace it with Spider Monkey panel. Then select the panel stack splitter that contains the new Spider Monkey panel and choose configure. Ensure all the panel stack splitter settings and names in all tabs are identical to before, especially the "PanelList > Forced layout" setting. So back up the layout before making the change so you can compare the settings in the layouts. I previously posted you detailed instructions on how to do this. In the end I believe you weren't able to accomplish it and I posted an updated DarkOne v4.0 version. If you aren't able to update it yourself this time I can update it for you. So please advise if you want me to do that. However, I'll likely wait a while to see if any issues come up with the new Spider Monkey panel version of Biography. Yes! Please help me with a modded version of DarkOne! YAY! I don't mind waiting at all, only when you have time will be fine! Thanks a million for your guidance, really, really appreciate it! When foobar is started and the first song is played, no artist picture appears. The Foobar stub image is displayed, although some Artist images are already stored in the cache. Only when the second song is played the artist images appear. From now on Biography-Script works correctly. I would be happy if this bug is fixed. Here runs Foobar 1.4.1 with the current Spider Monkey. With Biography 0.9.0.2 this bug did not exist. On the next version, would it be possible to add an option "Enlarge on mouse click", which would toggle between "image only / image+text" mode, like the option "Enlarge on mouse over" ? I did the code on my setup, i just didn't add it as an option available through the right-click menu, so on my setup it's always on. But i guess it won't take you much time to make it an option, using my code below. Mouse middle click already toggles image only vs image + text (it's described in the documentation).